We’d love your help. Let us know what’s wrong with this preview of Marrying the Wedding Crasher by Melinda Curtis. To ask other readers questions about Marrying the Wedding Crasher, please sign up. Marrying the Wedding Crasher is part of the Harlequin Heartwarming line that consists of sweet, contemporary novels. This book is one of a long line of fun stories in the Harmony Valley series, however, it can be enjoyed as a stand alone novel. I really liked this book. There were plenty of humorous moments, as in all of the books in this series. Yet, there were also some deep hurts and fears that the main characters had to overcome. I really liked watching them navigate around Vince’s family as Marrying the Wedding Crasher is part of the Harlequin Heartwarming line that consists of sweet, contemporary novels. This book is one of a long line of fun stories in the Harmony Valley series, however, it can be enjoyed as a stand alone novel. I really liked this book. There were plenty of humorous moments, as in all of the books in this series. Yet, there were also some deep hurts and fears that the main characters had to overcome. I really liked watching them navigate around Vince’s family as they pretended to still be in a relationship. The tension skyrocketed upon the news that Harley was pregnant! I loved this story from start to finish and the epilogue was a great way to finish the book. When I get a book to read, I generally don’t go back and look at the blurb for the book. I just jump in. I have had the book for a week before I was able to start reading it. Then when I was finished, I went back to look at the blurb before writing my review. I was kind of shocked to see that the pregnancy was the top of the blurb. To me, it was a critical point in the book, a curveball that changed the way the characters interacted with each other and their emotions. I liked seeing the shock on When I get a book to read, I generally don’t go back and look at the blurb for the book. I just jump in. I have had the book for a week before I was able to start reading it. Then when I was finished, I went back to look at the blurb before writing my review. I was kind of shocked to see that the pregnancy was the top of the blurb. To me, it was a critical point in the book, a curveball that changed the way the characters interacted with each other and their emotions. I liked seeing the shock on their faces and I had the same reaction. It was like a spoiler and I wish it wasn’t handed out to everyone. Just sayin…. It took me awhile to get into the book. I don’t really know why, I can’t pinpoint it. But after awhile, I was all into it! I liked this couple! I was sad for them and their circumstances. Vince was plagued by his dad’s mental illness and his mom’s leaving him and his brothers when he was in high school. He worries that he will become like his dad. He doesn’t want to get married or have children because of it. Vince puts others first but can’t do anything for himself. Harley is an architect who quit her most pivotal part of finishing up her schooling. Now she is doing tile work in homes. She has quite a vision when it comes to her architecture. She has a little secret about it that keeps her from moving forward with it. I loved the dynamics of Vince’s family. Each brother is different. They are all hard workers and they all have big hearts! They come from a small town in California were everyone knows everyone else’s business and they even have a phone tree where the gossip spreads! Everyone in town knew that Harley was pregnant before Vince did! They have old women and men who like to put their two cents in at every turn. Love it!! This is such a fun book! It’s swoony, yes, and truly heartfelt but there’s a lot of humor too. The town of Harmony Valley is full of quirky octogenarians with a phone chain that passes out gossip faster than…well… than gossip spreads through a small town. “Who does Irwin belong to?” Oh Irwin… I adore Irwin. The elderly man who wants to run with the bad boys and win his fair lady’s heart. The scene with the motorcycle – and the scene in the beauty salon – both had me literally laughing out loud. Vi This is such a fun book! It’s swoony, yes, and truly heartfelt but there’s a lot of humor too. Vince Messina’s story is revealed in layers, each more heartbreaking than the one before. A little boy forced to take responsibilities that were never his to bear. A man still defeated by the hurtful words spoken over him. A man held captive by fear. And yet, there is healing here too. Family healing as well as the slow mending of a wounded heart. Curtis does a great job of framing Vince’s past pain with Harley’s warmth and big heart. He grows into his Disney hair (you’ll understand after you read the book) and at the center of this is Harley – the woman he’s terrified to love. Bottom Line: You will laugh a lot, cry a little, and swoon often in Marrying the Wedding Crasher by Melinda Curtis. I always love a trip to the hilarious Harmony Valley, and you’ll be hooked too in a matter of pages. Vince and Harley are both strong protagonists who are easy to love and easy to cheer on. They are surrounded by a solid cast of delightful supporting players who bring even more heart and humor to the mix. A great read all around. i read this book because my friend sara told me to. (hi, sara!) i don't usually read harlequin romances. this isn't my usual jam. i think that needs to be said before i get to the rest of the review because i'm going to be picky about stuff that i'm sure other readers of this genre have zero problems with. marrying the wedding crasher (which implies an entirely different plot, btw) focuses on vince messina and harley o'hannigan, who refers to herself as harley o'hannigan repeatedly so you can tell that the author was really happy with that name! this book has my all-time favorite trope, the Fake Dating Trope, but i felt like a lot of the interesting stuff happened offscreen before the events of the novel. (also, the fact that this book spoils the BIGGEST PLOT TWIST on the back of the damn thing is truly BAFFLING to me!!) anyway, harley and vince pretend to be dating when they go to happy valley or whatever it's called for vince's brother's wedding, and what follows is just drama for the sake of drama, stars hollow on crack level locals, and men being assholes but expecting me to view them as Sensitive and Guarded. also, vince's mom? doesn't deserve a redemption in my opinion. also, maybe don't try to include mental illness in something like this. it didn't come close to being portrayed in an accurate way. Marrying the Wedding Crasher (2018) by Melinda Curtis is part of the Harmony Valley series, but does read as a stand-alone story. This book is set to release tomorrow, March 6, 2018, by Harlequin Heartwarming Publishers. This book will be available in all forms including eBook, and is 384 pages in length. With a full-time job and a very busy five-year old at home, this book took me two days to read. I received a copy of this novel from Harlequin Heartwarming in eBook form for review. In no way h Marrying the Wedding Crasher (2018) by Melinda Curtis is part of the Harmony Valley series, but does read as a stand-alone story. This book is set to release tomorrow, March 6, 2018, by Harlequin Heartwarming Publishers. This book will be available in all forms including eBook, and is 384 pages in length. With a full-time job and a very busy five-year old at home, this book took me two days to read. I received a copy of this novel from Harlequin Heartwarming in eBook form for review. In no way has this influenced my opinion. The opinions expressed in this review are my own. I give this novel 4.5 STARS. Marrying the Wedding Crasher is a Contemporary Clean Romance. One day when I was seven years old, Sr. Regina, my 2nd grade teacher, gave me and my fellow classmates a brown paper bag. We were told to decorate them prettily and make sure to include our names. These bags were going to be our Valentine’s Day bags! She also told us to make/buy Valentine’s Day cards for our fellow classmates. I can remember vividly putting my whole 7-year old self into my bag, and later into the cards I made for my classmates. Valentine’s Day arrived and I excitedly hurried to class. I could not wait to pass out my cards and then enjoy the cards I got from my fellow classmates. After the craziness that is 2nd graders distributing cards and moving around the classroom, Sr. Regina asked us all to open our bags and dig into our cards and candies. I was SO excited!!! I opened my bag and saw three cards total. No candy. Just three cards. My little 2nd-grade heart dropped, but I was ok because something is better than nothing, right? Two of the cards were the store-bought kind, and one was hand written. I was excited for the hand-written card because it meant someone took time for me! I opened the note and read, “Happy Valentine’s. Nicole, you look like a clown.” I was devastated. I got up, went to the back of the classroom, and buried myself behind the coats and backpacks. I sobbed my little heart out. I was embarrassed and heartbroken. I was seven years old when someone’s words crushed my heart and made me see myself differently. I became a very closed-off kid from that day forward, and I began to really hate the way I looked. I hated that I had to wear glasses. I hated that my prescription was so thick it looked like I was wearing coke bottles. I hated that my family was poor and I couldn’t afford cute glasses, just glasses from the cheap section in the eye doctor’s office. I then started to really look at myself in the mirror… AT SEVEN!!! I decided I hated my big nose. I hated my ugly teeth. I hated my limp hair. I hated me. It should be noted that I have a really pretty, skinny mom. The kind of pretty, skinny that the world says is perfect. I am about as opposite as you can get. Guess when I noticed that?! Yep…right after I got told I look like a clown. I have been battling that note every day since I was seven years old. If you are still reading this, you are probably wondering by now what this has to do with Marrying the Wedding Crasher. Marrying the Wedding Crasher is a good, solid story. It has exactly what you look for when you want a Harlequin Heartwarming-type story. The characters are well written and realistic, the plot is very engaging, and the romance is sweet. I do very much recommend it for all of these standard qualities, BUT, I really recommend this book because of what it reminded me: words are SO very important, and they can be blessings or weapons. Of all the characters in this book, I relate to Vince Messina. Vince, of course, is the perfect Harlequin Heartwarming hero — he is gorgeous, he is kind, he is all man! So, I definitely cannot relate to his gorgeousness and his manliness, but I can relate to him in regards to this “words” issue that I’ve been discussing. When Vince was a teenager someone very important to him said something in an emotionally-drained moment and it completely changed the course of his life. Vince was never going to be the person he was BEFORE THE WORDS ever again. After my Valentine’s Day card fiasco in the second grade, I was never going to be the same bright-eyed, happy, blissfully ignorant girl ever again. We need to be SO careful with our words. This is an excellent reminder for me as a wife and mother, but also as a teacher. The words we use can have positive effects on those around us, or they can do great harm. Ephesians 4:29 states, “Do not let any unwholesome talk come out of your mouths, but only what is helpful for building others up according to their needs, that it may benefit those who listen.” God wants us to use our words to build others up, not tear them down! Marrying The Wedding Crasher is a heartwarming contemporary romance story that follows the unexpected relationship of Harley O'Hannigan and Vince Messina. Vince Messina needs a date for his younger brother Joe's wedding. Vince has been able to keep his brothers at arm's length about his personal life for years. But there is no getting out of going back home to Harmony Valley, California, so Vince asks his ex-girlfriend and co-worker Harley O'Hannigan to be his date after he let it slip to his bro Marrying The Wedding Crasher is a heartwarming contemporary romance story that follows the unexpected relationship of Harley O'Hannigan and Vince Messina. Vince Messina needs a date for his younger brother Joe's wedding. Vince has been able to keep his brothers at arm's length about his personal life for years. But there is no getting out of going back home to Harmony Valley, California, so Vince asks his ex-girlfriend and co-worker Harley O'Hannigan to be his date after he let it slip to his brothers that he has a girlfriend. From the day that Vince and Harley met there was a strong connection and mutual attraction between them. But a misunderstanding and Vince's personal baggage and tough exterior waylaid the development of their relationship. Can a seemingly harmless wedding invitation to a family wedding change Vince and Harley's pretend relationship into a real one ... or will family secrets and emotional baggage keep them from reigniting the romance that they once briefly shared? Author Melinda Curtis weaves a wonderful tale full of pain, angst, drama, humor, and tender romantic moments that easily draws the reader into Harley and Vince's story. The dramatic development of their relationship makes this story worth the read, as their connection is put to the test by serious personal issues in their lives. You can't help but feel for Vince as he struggles with his past emotional baggage, and cheer for Harley and Vince on as they try to move beyond a pretend relationship with a few surprises along the way! Marrying The Wedding Crasher has an intriguing cast of characters who are realistic, flawed, and easy to relate to; witty dialogue and engaging interactions; and a wonderful storyline that will take you on a beautiful journey towards a happily-ever-after. If you are looking for a hopeful and heartwarming love story that follows the unexpected journey of two people who learn to let go of their pasts and open themselves up to a healing and loving relationship, then Marrying The Wedding Crasher is the story for you! Disclaimer: I received a copy of the book from the author/publisher in exchange for my honest review and participation in a virtual book tour event hosted by I Am A Reader. I love a book that leaves me smiling. When I started it, knew I'd like it but didn't expect it to trigger so many emotions. Vince didn't want to go back to his home town because of the bad memories he had growing up there. But his brother was getting married so he had to go whether he wanted to or not. He could get through this. It was only for a week. But he needed a date and didn't have one. Harley agreed to pretend to be his girlfriend and go with him even though they weren't seeing each othe I love a book that leaves me smiling. When I started it, knew I'd like it but didn't expect it to trigger so many emotions. Vince didn't want to go back to his home town because of the bad memories he had growing up there. But his brother was getting married so he had to go whether he wanted to or not. He could get through this. It was only for a week. But he needed a date and didn't have one. Harley agreed to pretend to be his girlfriend and go with him even though they weren't seeing each other any more. I liked Vince and Harley. It was fun to see them pretend to be in a relationship when they were around his family. I especially liked the older residents. They knew what was going on in town as soon as it happened. It was incredible how fast news travelled in Harmony Valley. What a great book! I loved the story – the humor, the emotion, the romance. I really enjoyed being with the Messina family. I loved the banter between them. It was fun to watch Vince and Harley try to prove they were a couple to the family. It was What a great book! I loved the story – the humor, the emotion, the romance. I really enjoyed being with the Messina family. I loved the banter between them. It was fun to watch Vince and Harley try to prove they were a couple to the family. It was great to be back in Harmony Valley! Oh, the elderly residents make me laugh! They always add to the story. I’m looking forward to going back soon! I received a free, advance copy of this book and this is my unbiased and voluntary review. Vince Messina returns to his small hometown for his brother’s wedding. It is a place fill with bad childhood memories of his dad and their mom leaving. He brings along Harley O’Hannigan as his plus one whom he been seeing for a month so he would not have to attend it alone. Secrets are a bound as they reach Harmony Valley which may soon tear them apart. What started out as a pretend relationship might just turn out to be forever. A sweet love story featuring another Messina brother. Vince and Harley were both wonderful characters. Vince has always avoided relationships because of a fear that he may turn out like his father. He and Harley had dated briefly, but then he makes a deal with her to take her as his date to a family wedding in order to keep his family from hounding him about settling down. There were certainly some tense and emotional parts to the story, but the sense of family really came through. I loved all of the characters in this stor I really liked this story. 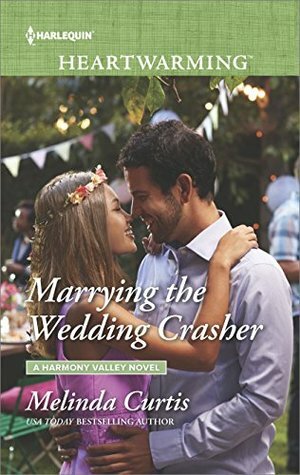 “Marrying the Wedding Crasher” by Melinda Curtis is part of her Harmony Valley series and features Vince Messina and Harley O’Hannigan. Vince hasn’t been back to Harmony Valley in years and is only back now to attend his brother’s wedding (Joe from “Marrying the Single Dad”). Having only phone conversations over the years, and to keep his brothers off his back, Vince pretended he has a girlfriend. Now, he needs to prove to them he actually does. The only person who comes to mind is Harley O’Hanni “Marrying the Wedding Crasher” by Melinda Curtis is part of her Harmony Valley series and features Vince Messina and Harley O’Hannigan. Vince hasn’t been back to Harmony Valley in years and is only back now to attend his brother’s wedding (Joe from “Marrying the Single Dad”). Having only phone conversations over the years, and to keep his brothers off his back, Vince pretended he has a girlfriend. Now, he needs to prove to them he actually does. The only person who comes to mind is Harley O’Hannigan – a woman he dated briefly. Harley, still attracted to Vince despite refusing to go out with him again, is trying to rediscover her confidence after an architectural design she created failed. She’s been working with Vince on a construction site and in exchange for Vince repairing one of her tools, she agrees to go to Harmony Valley with him. Going home is hard for Vince because there were a lot of things that happened during childhood that Vince never shared with his brothers. He’s very protective of his family and tends to keep his emotions bottled up, hiding who he truly is. Harley makes him want to open up and share. Ms. Curtis has created complex characters in Vince and Harley as well as creating fantastic secondary characters in the elderly residents of Harmony Valley. In each installment of this series, this reader enjoys “checking in” with them. “Marrying the Wedding Crasher” will make you laugh out loud and blink away tears – the perfect blend of emotions to experience when reading a book by Ms. Curtis. I love Harmony Valley. The old people are so much fun. Vince and Harley tried to make a go of it before, but Vince isn't the marrying kind. Or is he? Vince is forced to confront a lot of old family secrets when he goes home to watch his little brother get married. He brings Harley to be a buffer against his family and people of Harmony Valley who like to be match makers. Harley is dealing with her own problems, but agrees to help Vince. Is she just setting herself up for heartache? Marrying The Wedding Crasher has it all. There is love, pain and second chances. Harley O'Hannigan has a front row seat to the drama. She's agreed to go with Vince Messina to his brother's wedding. She and Vince had dated for a short time. Now they are pretending to be a couple. What could possibly go wrong? Harley is a sweet and feisty woman but she's hurting. Her dreams seems unobtainable. I felt her pain. I hated to see her give up. Vince likes Harley, but with his past he doesn't want anythi Marrying The Wedding Crasher has it all. There is love, pain and second chances. Harley O'Hannigan has a front row seat to the drama. She's agreed to go with Vince Messina to his brother's wedding. She and Vince had dated for a short time. Now they are pretending to be a couple. What could possibly go wrong? Harley is a sweet and feisty woman but she's hurting. Her dreams seems unobtainable. I felt her pain. I hated to see her give up. Vince likes Harley, but with his past he doesn't want anything permanent. He has family secrets that he can't escape. My heart broke. The chemistry between Harley and Vince is powerful, but he's so stubborn that he won't give into his feelings. Their flirty dialogue was sweet. These two made me smile. I loved coming to Harmony Valley. The residents are unique and good hearted. The Messina Family has endured so much heartache. I couldn't believe how rough life has been for them. I wanted them to get the closure they needed. I enjoyed this emotional story. Melinda Curtis has written characters that tugged at my heart. I love these types of stories. Fake wedding date to pull one over on the family. But are they just kidding themselves?? Secrets revealed and family ties broken and mended make for at least one happy ending. Will there be another? Vince doesn't want to go home for his brothers wedding. He never wanted to set foot there again. With his family and history along with secrets he just doesn't feel the need to go. But he has to and he needs a date. And who better than the woman he can't get out of his he I love these types of stories. Fake wedding date to pull one over on the family. But are they just kidding themselves?? Vince doesn't want to go home for his brothers wedding. He never wanted to set foot there again. With his family and history along with secrets he just doesn't feel the need to go. But he has to and he needs a date. And who better than the woman he can't get out of his head. Harley. Harley hates doing tile work. But with her failure and clause in her contract she can no longer be an architect. At least for four years. Unless she can come up with a way to make her design work. And she doesn't see that happening. But she needs money so any work will have to do. But Vince is a distraction. And he needs her help. But after their falling out a month ago she doesn't know. She agrees and that's where the fun begins. Vince and Harley are so compatible and their chemisty is another reason neither should be together. She wants a family. And he is set against a wife and kids. Bit things don't always go as you want. And Vince will get the surprise of his life in more ways than one. I loved this book!! Just like the others, it’s total romance. This especially touched me because of the background subject matter. I have been in those shoes. Melinda, you did a great job of handling the “taboo” subject! Thank you for speaking out through this book!! Absolutely loved the book. Loved the way Harley realized she was in love with Vince. Loved how Vince was in love with Harley and how he finally learned to deal with his past. I could only wish a man would propose to me the way he did Harley. I hope there are more in this series. When you give everything you have and made to feel like you are nothing it can affect you no matter what age you are. This is what happens to both the main characters but in different ways. It is a story about hopes, dreams, sorrow, misunderstandings, pain, mending, filled with love, forgiveness, sometimes dreams do come true. This story touched me in so many ways the author knows how to reach in touching your heart with so many emotions come home to Harmony Valley where you will laugh, cry, che When you give everything you have and made to feel like you are nothing it can affect you no matter what age you are. This is what happens to both the main characters but in different ways. It is a story about hopes, dreams, sorrow, misunderstandings, pain, mending, filled with love, forgiveness, sometimes dreams do come true. This story touched me in so many ways the author knows how to reach in touching your heart with so many emotions come home to Harmony Valley where you will laugh, cry, cheer and say a few not so nice words as characters twist their way into your heart as they work on heartbreaking issues that have been out of their control with families that love them but might not always do it in the way they think they should. Vince comes off as somewhat of a jerk but truly he just doesn’t know how to say things right. Harley has a secret she can’t share as to why she isn’t doing the job she was trained to do. Vince said some things that really upset her making her feel like she is a failure. One date was one to many for her and poor Vince doesn’t even know what he did wrong. Vince makes a habit of putting his foot in his mouth one big one was telling his family he was seriously dating Harley not his family expects him to bring her home to a wedding he doesn’t want to go home to. Heck he hasn’t been home in a lot of years only for holidays and only when he is made to. A lot of things happens between these pages, a lot of issues will be worked out with a lot of pain hitting hard as misunderstanding are worked out things get very completed filled with strong feeling, passion and one baby on the way. The author gives a story of so much pain wrapped around humor, smiles and laughs taking you down a road that will twist you apart and finally bring you home to a loving family, a new life and some major issues worked out for two people to find their happy ever after. A very heartwarming clean read that really touched me in so many ways. Vince hasn't been back to Harmony Valley since he left many years ago. His younger brothers have tried to get him to visit, but he always comes up with an excuse as to why he can't make it home. Joe, Vince's younger brother, is getting married and wants him to be a part of the ceremony. So excuses won't work. Vince decides he may be able to make it through the wedding festivities if he brings someone along. Harley is a dreamer and an architect. The combination leads her to design structures that Vince hasn't been back to Harmony Valley since he left many years ago. His younger brothers have tried to get him to visit, but he always comes up with an excuse as to why he can't make it home. Joe, Vince's younger brother, is getting married and wants him to be a part of the ceremony. So excuses won't work. Vince decides he may be able to make it through the wedding festivities if he brings someone along. Harley is a dreamer and an architect. The combination leads her to design structures that aren't necessarily "buildable", but can be entered into contests to gain notarity for her architecture firm. Instead, her boss sells and accepts payment on one of her designs. Upset that she can't come up with a solution, her boss harasses her and won't let her out of her contract. Therefore, she can't work in architecture until her contract is up or she finds a solution for her boss. So Harley works as a tiler on various construction jobs, where she meets Vince. After dating for awhile, Harley dumps Vince. Vince rescues Harley from her abusive boss, but couldn't salvage her saw. Harley needs the saw to work in order to pay bills. Low on money, she turns to Vince to see if he can fix it. He can't, but makes a deal with her. If she'll be his plus one at his brother's wedding, he'll get her another saw or fix hers. Harley agrees. I absolutely LOVED this novel as it was different from anything I've ever read. There were so many minor stories, woven together to reveal one complete story, seamlessly. A relatable, compassionate, encouraging, and funny story all combined into one wonderful novel! The surprise twist at the end just made the story even better! I can't wait to read about the rest of Vince's family. I read a gifted copy and all opinions stated are my own. I enjoy every trip I make back to Harmony Valley. This time round we meet Vince Messina. He's coming home to his brother Joe's wedding. Naturally he can't go back alone. He needs a date and the only person he would ever consider asking is the girl who he's still hung up on even after breaking up with. After all he knows he can never truly commit to a relationship and bring the hell that his father brought to their house on anyone he truly loves. Harley O’Hannigan has a secret that has her working I enjoy every trip I make back to Harmony Valley. This time round we meet Vince Messina. He's coming home to his brother Joe's wedding. Naturally he can't go back alone. He needs a date and the only person he would ever consider asking is the girl who he's still hung up on even after breaking up with. After all he knows he can never truly commit to a relationship and bring the hell that his father brought to their house on anyone he truly loves. Harley O’Hannigan has a secret that has her working as a lowly construction worker despite her architect's degree. She's bound by law and unable to share her troubles. That makes Vince think that she's simply throwing away the advantages that a good education have given her. If only things were as simple as they seemed, but in Harley's life nothing ever is. Now Harmony Valley plays it's magic between the two. Of course things become a bit more complicated when Harley realizes that she's pregnant with Vince's baby. Vince runs from the emotional attachment, convinced that he's doing the best for her. She may have lost one Messina with her pregnancy announcement but she's gained a ready made family with his brothers and their wives. Vince is the protector of his family and always has been. Despite being the middle child, he took on the responsibility of covering for his dad’s inadequacies as a child. He also harbored a secret from his brothers that had the power to cause them to hate him, and so he avoided them. Until he had to return to Harmon Marrying the Wedding Crasher was everything I’ve come to expect in a book by author Melinda Curtis. With a subtle sense of humor, her books are lighthearted and fun despite the drama. Secrets abound as we head back to Harmony Valley! Melinda Curtis always brings us a heartwarming, sweet romance when we visit her make-believe world, and this time was no exception! The characters catch our attention quickly and the drama surrounding them intrigues us from the start. He seems like a nice guy, but she obviously broke up with him for a reason ... and she seems down-to-earth, but why all the secrets? The story unravels into a great exes reuniting and becoming better tha 4 1/2 STARS! Secrets abound as we head back to Harmony Valley! Melinda Curtis always brings us a heartwarming, sweet romance when we visit her make-believe world, and this time was no exception! The characters catch our attention quickly and the drama surrounding them intrigues us from the start. He seems like a nice guy, but she obviously broke up with him for a reason ... and she seems down-to-earth, but why all the secrets? The story unravels into a great exes reuniting and becoming better than ever type of story! Really enjoyed the visit to Harmony Valley! Vince Messina needs a date to his brother's wedding back home in Harmony Valley, CA ... but his best option dumped him! Can he convince her to play along with his ruse long enough to keep his family happy until he can hit the road and head back to Texas? Harley's life is turned upside down and nothing seems to be going right. When her ex boyfriend Vince makes her a deal and she try to find a solution that can work for both of them so that she can help him and get help to. Vince has to go home for a wedding but he has a list of secrets he's keeping and he knows it they come out they could destroy him. Can the both help each other and protect there hearts or will all the secrets come out and blow up in there faces? OMG this is seriously the sweeter Harley's life is turned upside down and nothing seems to be going right. When her ex boyfriend Vince makes her a deal and she try to find a solution that can work for both of them so that she can help him and get help to. Vince has to go home for a wedding but he has a list of secrets he's keeping and he knows it they come out they could destroy him. Can the both help each other and protect there hearts or will all the secrets come out and blow up in there faces? Harmony Hills is a very small town where they have a phone tree so everyone knows everything pretty much as soon as it happens and when all 3 Messina brothers finally re unite it is the talk of the town. Vince convinces Harley his ex and co-worker to go to his Brother Joe's wedding so they will leave him alone and not delve into his life, a good simple plan right? wrong! Having been the first time back home after a troubled upbringing Vince has to face his past that haunts him, as well as finall Harmony Hills is a very small town where they have a phone tree so everyone knows everything pretty much as soon as it happens and when all 3 Messina brothers finally re unite it is the talk of the town. Vince convinces Harley his ex and co-worker to go to his Brother Joe's wedding so they will leave him alone and not delve into his life, a good simple plan right? wrong! Marrying the Wedding Crasher by Melinda Curtis is her 11th book in the Harmony Valley Series. It does well as a stand alone but it will make you want to read the rest of the series. Melinda Curtis does a wonderful job of giving the reader enough information on the characters from previous books so you do not feel lose. This book is the story of Vince Messina and his visit home for his younger brother's wedding. Harley O'Hannigan is a co-worker of Vince and his plus one for the wedding as well as Marrying the Wedding Crasher by Melinda Curtis is her 11th book in the Harmony Valley Series. It does well as a stand alone but it will make you want to read the rest of the series. Melinda Curtis does a wonderful job of giving the reader enough information on the characters from previous books so you do not feel lose. This book is the story of Vince Messina and his visit home for his younger brother's wedding. Harley O'Hannigan is a co-worker of Vince and his plus one for the wedding as well as his pretend girlfriend. this is a tale of learning about second chances and learning that a child's view is not always true as they are lacking facts. It is also a tale of a family coming together. Prior to writing romance, award-winning, USA Today Bestseller Melinda Curtis was a junior manager for a Fortune 500 company, which meant when she flew on the private jet she was relegated to the jump seat—otherwise known as the potty. After grabbing her pen (and a parachute) she made the jump to full-time writer. Between writing sweet romance and sweet romantic comedy, Melinda finds time to bond w Prior to writing romance, award-winning, USA Today Bestseller Melinda Curtis was a junior manager for a Fortune 500 company, which meant when she flew on the private jet she was relegated to the jump seat—otherwise known as the potty. After grabbing her pen (and a parachute) she made the jump to full-time writer. Between writing sweet romance and sweet romantic comedy, Melinda finds time to bond with her husband over home remodeling projects. She recently came to grips with the fact that she’s an empty nester and a grandma, concepts easier to grasp than jet-setting on a potty.